"When I cut into one of my works to examine its structure, I feel like I'm looking at bones. The piece is thick where it needs to be for support and thin where there's no stress. Just like our bones. Pots have to have that kind of structural integrity." 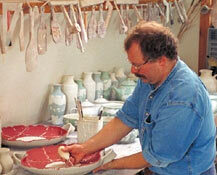 A potter since 1963,I. B. Remsen feels he is lucky to have found work that is perfect for him, work that allows him to express those things that he finds are most meaningful - functionality, beauty, and excellence. Remsen's work reflects a blending of the earth-bound with the fanciful. He shapes the earth's clay into a simple pot, a vessel for food or drink - but one whose functionality is tempered by delicacy and charm. The close intimacy and the high technical demands of his work are such that he employs no assistants or apprentices. He is a craftsman in the classical sense, creating each piece individually from concept through to completion. juried by John Glick and Suzanne Stephenson.